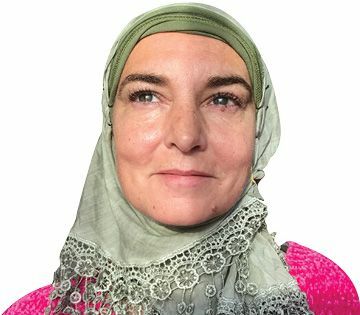 The Irish singer formerly named Sinéad O’Connor posted photos of herself wearing a hijab last week and announced, “I am proud to have become a Muslim.” She took the name Shuhada, which means “one who bears witness” in Arabic and is also the word used to describe martyrs. Her conversion “is the natural conclusion of any intelligent theologian’s journey,” she said. Born Roman Catholic, the singer famously tore up a photo of Pope John Paul II on a 1992 episode of Saturday Night Live. Shuhada has described herself as a victim of childhood abuse, and has said she suffers from bipolar disorder. A year ago, she went missing and turned up in a motel in New Jersey, saying she was battling suicidal depression. A ceremony in Dublin marked her conversion to Islam, and she posted a video in which she sings the Islamic call to prayer.